FCI was Founded In The Year 1965 At Tanjavuru Tamilnadu State,And It’s Head Ofiice iS Located At Our Capital I.e New Delhi.It’s Also One Of The Biggest Corporation In India. 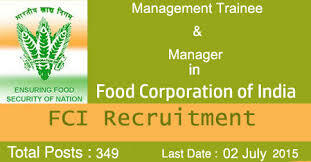 Food Corporation Of India(FCI) Had Recruiting For The Posts Of Management Trainee (MT), Manager posts(MP).Food Corporation of India has recently conducted written examination for selection of management trainee posts on 25th October, 2015 at various examination centres.The Aspirants Of This Written Examination Will Check Their Results And Merit List. The Aspirants Will Be On The Basis Of Group Discussion.Those Who Are Qualify Your Written Examination After Call For Personal Inrerview. The candidates who got selected for Management Trainee posts will undergo training for six months and will be paid Rs. 16,000/- per month. Management Trainees will be absorbed as Managers in the IDA and get paid around Rs. 16400-40500/- after successful completion of training period. Here We Are Providing More Information Will Be helpful For Aspirants With Zonal Wise Information. Click On Direct Link recruitment 2015-16. Select Your Zone And Apply On It. Your Results Will Be Shown On Screen. Then Select Your Print Option.